With a scorching heat wave currently engulfing the United Kingdom, it’s probably considered by many to be inappropriate to talk about cashmere wool products. However, with winter soon around the corner, in my opinion now is as good a time as any to share briefly about the benefits that this luxurious fabric brings to the table. 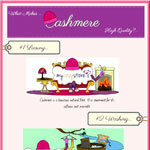 But rather than have me waffle on in textual format about the qualities of cashmere, I’ll leave it to this colorful cartoon infographic, commissioned by knitwear specialists of Hawick in the Scottish Borders, to shed further light on the subject.